Rogelio, a fellow Woodlorean from Spain, e-mailed us previously with some pictures of his hand-made crooked knife handle, which we posted on our blog. 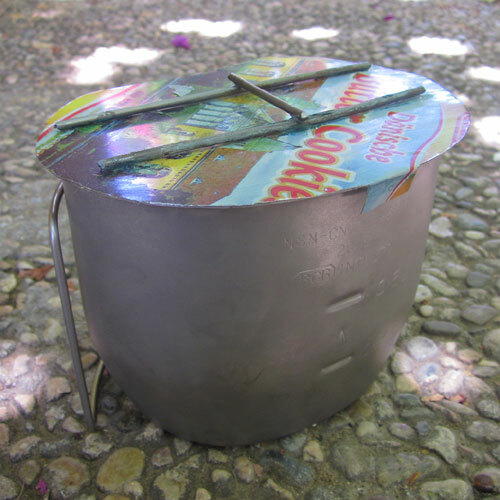 Recently, he got in touch with us again, this time with an excellent article on how to make a DIY meth-burning stove from just a tin can. We’ve posted the full guide below, complete with step-by-step pictures, for you all to see. Thanks Rogelio! I have just returned from a friend’s house with whom I have been making my own meth alcohol burner to fit in my pocket stove from tin cans, and after seeing how well it actually works, I thought it would be nice to share with you some pictures on its making. To start with, you need the bottom ends from two tin cans and a rectangular strip that will fit into them (this must be cut slightly higher than the other pieces, you’ll see why later). 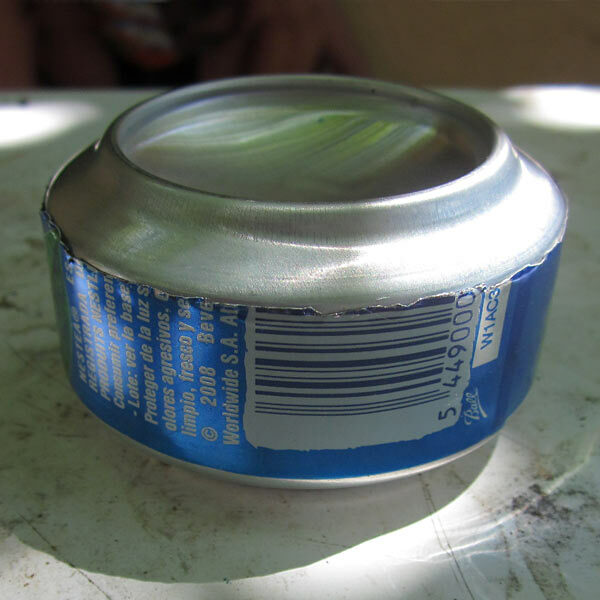 If you use cans made from stainless metals it’ll last longer. You now cut halfway through the width of the strip on both ends (and attach them together) so that it will stay in a circular shape, and then cut off the remaining bits. Now insert it in the slit of one of the cans. In order to make one can fit into the other, you must bend inside one of them around all of its circumference (I twisted it through using pliers). Ideally, it should be the strip placed in between them that stops the cans after pushing them together. Cut out the centre bit of one of them until its neat and tidy, and then punch small holes around its outside as shown (I used a fine nail and a hammer for this). 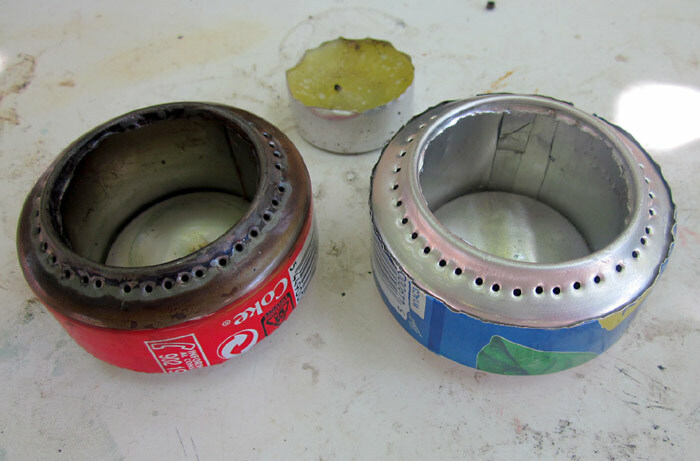 Having done two burners, I found that the one to the right works best, and I suspect it is because the bottom can fits outside the top one, allowing some vapours to escape from the other side of the holes and therefore encouraging the flames to go through them. The metal bars at the top are not only to hold the lid from, but also add weight and solidness. I glued them to begin with but ended up stitching them with fine wire at the middle and ends. 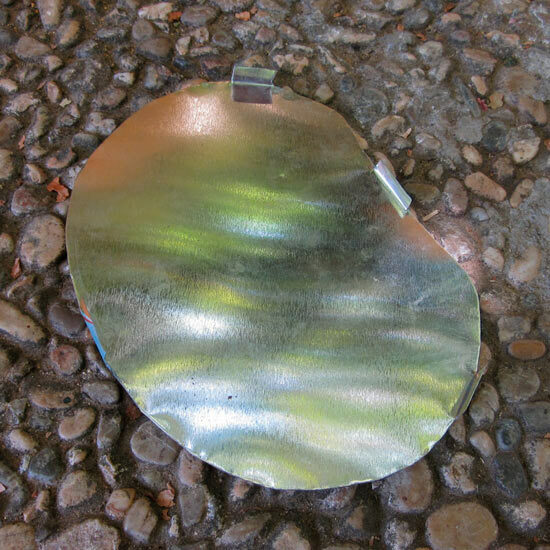 I was stunned to see that the set took half a litre of water to rolling boil in under six minutes, however at this time temperatures in Spain are very high indeed, so I suppose it will take longer in winter. I find in those circumstances, it will help to place a small candle under the stove to heat the alcohol. I also noticed that trangia burners have fibres inside them to help alcohol rise to holes, but I struggled to find any adequate material. However it works all right without them. I would sincerely appreciate any suggestions as to how I could improve the burner or any comments/questions that you would like to make about it. I would also encourage anyone who hasn’t got a burner to give it a try: it is a cheap, easy method and, most importantly, works well! This entry was posted in Bushcraft Clothing & Equipment, Bushcraft Tips & Guides, Customer Posts on September 13, 2011 by Woodlore Team. did you make your wood stove yourself? If so it would be nice if you gave some tips on how to make one. Made quite a few of the Pepsi stoves and given them away to anyone interested. I found the best way to stretch the bottom part of the tin was to use a full pepsi tin of the same size to push into the base and turn it round. After a few times of pushing the full can in the base of the stove was stretched enough to fit the top inside. It is important with the pepsi stoves to get a tight fit to allow the hot meths to build up pressure for the burner jets. I also stand the pepsi stove in a larger tin can about the same height as the pepsi can, this can be used to pre heat the filled pepsi can by pouring a small amount of meths and lighting it. A simple wire frame can be made as a pot stand for a crusader cup. 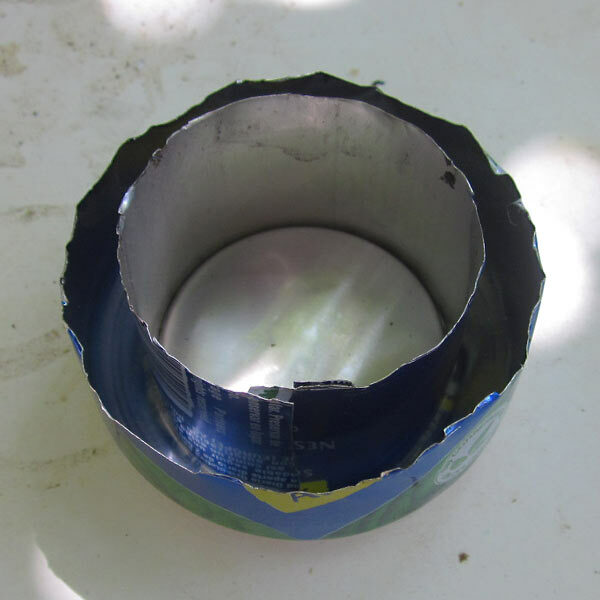 cutting the bottom of the cans too short won’t allow you to pour enough fuel at once and, since it is risky to refill a hot burner you would have to interrupt your cooking continuously. On the other hand, too tall a burner reduces portability. Also, I suppose it would be difficult for the methanol to reach the holes at the top of the burner when the alcohol level is low. I tried to make mine just so that it would fit inside my pocket stove but this was too short. 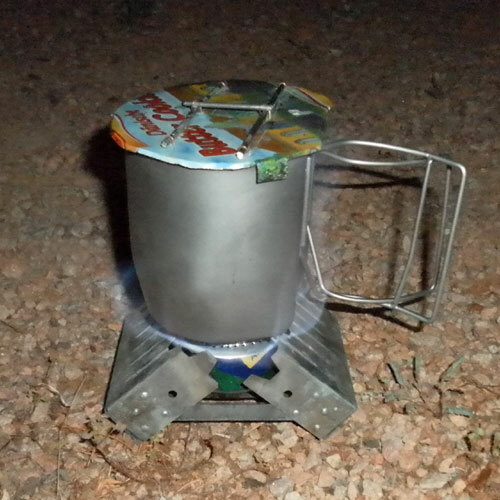 It is approximatelly as tall as a trangia burner and goes for about 20 mins, which is enough for simple cooking. It is approximatelly as tall as a trangia burner. If you want to prolongue burning time try making a taller one and see what happens. thanks for information. I’ll try do do something like yours. Do you think the height of the pieces (bottoms) is anything important or it only determines the amount of liquid you can fill in? The can filled with sand and petrol seems more of a survival technique to me than a piece of camping kit to me. I suppose the military used petrol because it was the only fuel they had available if they found themselves stranded on a remote place. However it is also possible that you have alcohols with you for other purposes (eg cleaning wounds) and in an emergency they could be used for cooking. I have never tried them in a pot with sand, but maybe it will work. thanks, I also think that despite using something as messy as tin cans the final product is quite sturdy. The alcohol is poured into the big hole in the middle and it will quickly find its way to the other side of the strip, from where, once lit, it will evaporate to the wholes. Rogelio, those stoves are very nice! Stupid question: where do you exactly put the alcohol? Used fibre-glass wadding in mine(the stuff you have in your loft) works well once it has warmed up. 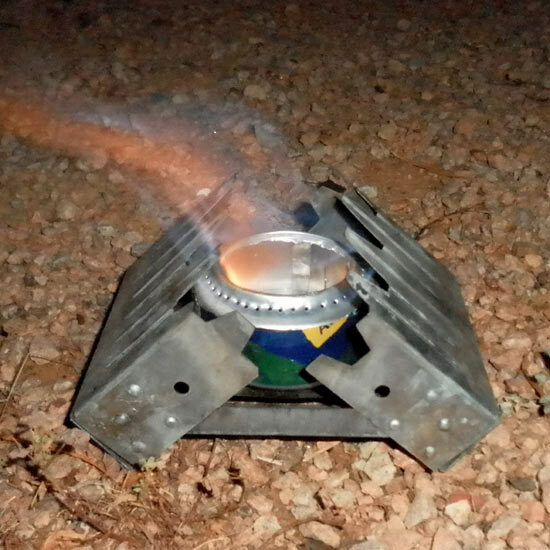 For those that are interested in alcohol stoves, here are two great links for alcohol stoves. This is great! I have been experimenting with top-lit updraught stoves (tweeting as @shanemuk using the #tlud hashtag) and blogging some experiences too. They’re a lot harder to light than the meth versions, but nice once they get going, and again you can do a lot with just some old tin cans. Thanks for the suggestions on the materials Sarah. I’ve been told by a friend that mehts are not as reliable in cold weather so maybe stuffing some fibres inside will help solve that problem. Hi Rogelio. Have you thought about using some loft insulation in the bottom of the stove between the inner and outer walls. I have used it in other designs of meths stoves with great results as it doesn’t burn, acts like a wick and should last as long as the stove itself. Thats ingenious- i love it. It does seem to work well without fibres, but if you want to try it with as an experiment, i suggest you search for Kevlar wick material, that is used by people to make fire staffs/ fire poi. I think that could be split down into fibres and used. Perhaps mineral wool would work too? Fantastic! I’ve never attempted one of these before. I’ll be heading out for a couple of weeks on the land very shortly – so, I’ll definately give this a try. We’ll see how I make out…keep you posted. Please do Katie – it will great to see how others get on with this project. Mine was made from a Boddingtons can! I’m thinking of making a couple more! One of the best Rogelio! Fantastic man. When i was in Barcelona with the school last year along the road there were pulled up cars with a couple meth stoves on the go, Great stuff 🙂 I’ll definately have to give this ago over the coming winter, Wulamallessin! Made these with my scout troop this year. Took a little effort to get one inside the other. Put them inside a drainage pot from Ikea that doubled up as a Hobo stove and cooked on them on our survival weekend.